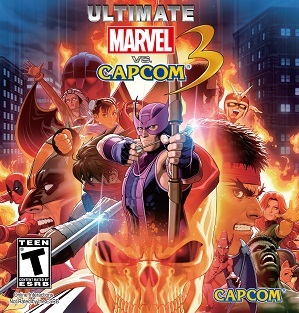 Includes all previously released Marvel vs. Capcom 3 DLC, including Shuma-Gorath and Jill Valentine characters, and extra costumes for all characters except Magneto. Aspect ratios other than 16:9 are letterboxed/pillarboxed. Can be forced from video card control panel. FXAA to FXAA3HQ. Up to 8x SGSSAA can be forced through Nvidia Inspector. No native option to disable it in-game and cannot be forced off. Game is capped at 60 FPS. Most Capcom characters have per-character option to switch between English or Japanese voiceovers. Both Marvel and Capcom roster. Amaterasu, Firebrand and Nemesis are only set in this language voice set by default. Capcom roster only. ↑ 1.0 1.1 File/folder structure within this directory reflects the path(s) listed for Windows and/or Steam game data (use Wine regedit to access Windows registry paths). Games with Steam Cloud support may store data in ~/.steam/steam/userdata/<user-id>/357190/ in addition to or instead of this directory. The app ID (357190) may differ in some cases. Treat backslashes as forward slashes. See the glossary page for details.